There are way too many people to thank and I know I will forget people! Thank you to the CREATORS of the pinball industry, the manufacturers, designers, software developers, artists, sound engineers, animators, mod developers, home-brew machines, etc., etc. Thank you to the content creators – all of you that spend time on creating podcasts, Twitch streams, YouTube content, websites, photography, publications, etc., etc. Thank you to all of you that are growing pinball – the operators, tournament directors, technicians, people and volunteers that run conventions, people that bring games to the conventions, etc., etc. Huge thank you to the sponsors of the show – Marco Specialties and Flip N Out Pinball. Thank you to the TWIPY Committee: Colin MacAlpine, Greg Bone, Lloyd Olson, Steve Bowden, William Oetting, Zach Meny and the countless hours you spent helping make the TWIPY Pinball Awards Show a great show. Thank you to Ed and Kim Vanderveen, Paul McKinney, and the entire team at the Texas Pinball Festival. Thank you to all guest presenters: Antoinette Johnson, Butch Patrick, Charlie and Bug Emery, Chris Franchi, Dwight Sullivan, Eric Meunier, Jack Danger, Jack Guarnieri, John Rhys-Davies, Ken and Bill from Special When Lit, Krystle Gemnich, Marty Robbins, Mrs. Pin and Dr. Pin, Rachel and Cale from Marco, Robin from Pinside, Scott Danesi, Steve Ritchie, Todd MacCulloch. Thank you to all of you that helped set things up in that small window before the show began: Jeff Teolis, Ryan White, Nicole Meny, Jason Schmidt, Priscilla Schmidt, Bud Sommerville, Jason Fowler, Christian Line, Sarah Line, and a bunch more that I am forgetting! Thank you to Christian Line and Sarah Line for the TWIPY tie I wore during the show! Thank you to Joel Reeves, who was the DJ for the show and did a great job. Thank you to William Oetting, who was asked at the last minute to run the videos for the show and did a great job. A HUGE thank you to Richard Barnett and Howard Barnett, the Audio/Visual specialists at the Texas Pinball Festival. We asked about a million questions to you guys in the months leading up to TPF and on Friday and Saturday at TPF, and appreciate your patience and efforts – we couldn’t have done the show without you and you did an incredible job. A HUGE thank you to William Oetting, who helped develop the online ballot for the TWIPYs and was a huge help to the show in tons of different ways, and is a huge help to This Week in Pinball in general. Finally, I can’t thank Zach and Greg from Straight Down the Middle enough for all they did to make this an incredible show. From all your efforts with the amazing video production, to trying to figure out the best ways to light the stage and have the best production quality for those in attendance in person and those watching at home, to a million other things leading up the the show, THANK YOU. And for the incredibly difficult job of hosting the show, and making that look easy, thank you. THANK YOU THANK YOU THANK YOU. 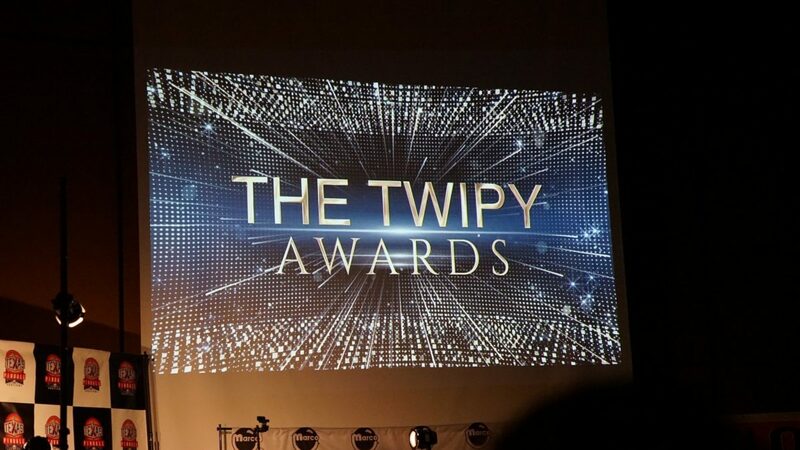 3/23/19 at 8:15PM: The LIVE TWIPY Awards Show!